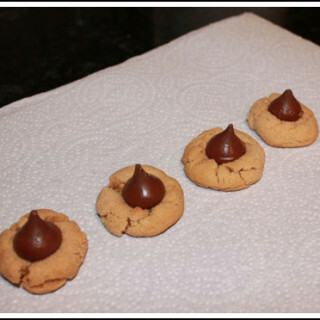 Peanut Blossom Cookies are peanut butter cookies with a Hershey's Kiss in the center. The recipe was introduced at The Pillsbury Bake-Off. In a mixing bowl, combine the softened butter, peanut butter and both sugars. Beat at medium speed until light and fluffy. Add egg, vanilla, and salt and continue beating until well mixed. Add baking soda, stirring to break up any lumps, and then add flour. Beat on low or by hand until well mixed. Cover bowl and chill for 30 minutes. Alternatively, if you have a small cookie scoop you can scoop out your 48 portions onto plates or a tray and chill the portions. Heat oven to 375°F. Shape the portioned dough into neat balls (or scoop and shape if you’ve just chilled the whole bowl). Roll balls in 1/4 cup sugar and place 2 inches apart onto ungreased cookie sheets. Bake 8-10 minutes or until very lightly golden brown. Immediately press 1 chocolate kiss in center of each cookie and then quickly return to the oven for 20 to 30 seconds. This softens the chocolate a bit, and even when it re-sets the Kiss stays softer.